This Chapter aims to accompany the voyages of different theories by seeking to delineate the principal outlines of the encounter between queer theory and decolonial thinking. In a preliminary way, with no pretensions of reaching definitive answers, it formulates questions such as: could this encounter between decolonial thinking and queer theory produce something else that might be thought of as “decolonial queer”? Or are these theories incompatible, given that the term queer, rendered in English, signals the very sort of geopolitics that decolonial thinking attempts to counter? Is there any commonality between these proposals? What is the potential of this encounter, and what might it produce? And what sorts of movements would a queer decolonial reading design? Agamben, G. (2006). Metropolis. Generation online. [Online]. Available at: http://www.generation-online.org/p/fpagamben4.htm. Acessed 20 June 2018. Cabral, M. (2003). Ciudadanía (trans) sexual. Artículo sobre Tesis Premiada, Proyecto “Sexualidades salud y derechos humanos en América Latina”. IESSDEH – Universidad Peruana Cayetano Heredia. [Online]. Available at: http://reconstruyendoelpensamiento.blogspot.com.ar/2008/04/ciudadana-trans-sexual-por-mauro-cabral.html. Acessed 17 June 2018. Canfield, L. (2009). 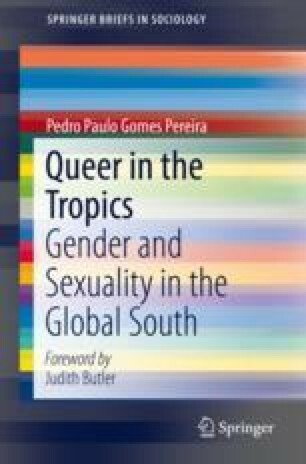 Locating the Queer in Postcolonial/Decolonial Discourse: A Bibliographic Essay. [Online]. Available at: http://ramsites.net/~ercanfield/assets/locatingthequeer_oggel_2009.pdf. Accessed: 22 June 2018. Lugones, M. (2005). The coloniality of gender. Worlds and knowledges otherwise. [Online]. Available at: http://www.jhfc.duke.edu/wko/wko2.2genderanddecolonial.php. Acessed 20 June 2018. Perez, E. (2014). Why do we need decolonial queer theories? Conferência apresentada no encontro annual da American Studies Association, Renaissance Hotel, Washington D.C., 28 Nov. 2014. Available at: http://citation.allacademic.com/meta/p314843_index.html. Accessed 20 June 2017. Segato, R.L. (2006). Qué es un feminicídio. Notas para un debate emergente. Mora, Revista del Instituto Interdisciplinar de Estudios de Gênero. Brasília: Universidade Nacional de Brasília. Série Antropologia, 401. Available at: http://www.feminicidio.cl/jspui3/bitstream/123456789/344/1/segato.pdf. Acessed 20 June 2018.